Why OMSB planted? To increase my carrying capacity instead of needing to buy more land to do this and to provide for a better level of grazing flexibility for both my sheep and cattle. What grazing & pasture benefits have been observed? Allows my country to be spelled at critical times and I always know I will have feed for my stock during dry times. I also believe that I am seeing better grass growth on the rest of my country. So far I have not had to eat the grass paddocks so hard and there is always good ground cover. The saltbush paddocks to date are developing a bigger range of grass species than in the open paddocks. Im also seeing that the grasses are growing for longer periods during the year in the saltbush paddocks. What financial benefits have been observed? I can now carry more stock and do it easier all year, so this gives the property a much greater return. Grazing is my main income and the area of saltbush planted so far is giving very good and consistent economic returns. The other area that has had a big impact is that our handfeeding has been reduced considerably. I find it hard to believe at times that such a small area of my property planted to saltbush can make such a big and beneficial impact on the rest of my country. Biggest OMSB impact? This might sound strange but I think the biggest single impact would have to be the fact that it makes me feel good just to see it there. Its green and always growing when everything else is struggling or has been burnt off. I also like the feeling of knowing Im using more of my soil profile. Its sought of like you are able to have more power from your country. Any problems with OMSB? I had a bushfire go through one of my blocks and this took out feed that I was relying on. The omsb is growing back which is a good sight and it seems to be stronger in leaf than before. Fencing setup needs extra effort and planning. Do you / if you had a salinity problem, do you think OMSB would help with controlling deep drainage and/or lowering the water table? It would definitely help. The plant is so strong that it would have to work on salt country. I just know what it has done to fix scald country here. Would you like to increase your area sown to OMSB? Yes, I never regret the day I started to plant omsb. What limits your planting of a larger area? Finance and the tight casflow problem for the first couple of years. The first bush planted is now starting to help pay for my new blocks. 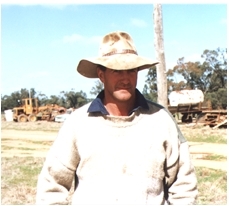 Jim operates in country that has considerable variability in its rainfall distribution. It has surprised us all how well blocks of omsb have established under at times fairly low moisture levels. In fact the last block planted went nearly 8 months before any rain and still maintained a high establishment rate. Yinkel, n.: A person who combs his hair over his bald spot, hoping no one will notice. -- Rich Hall, "Sniglets"